We often think that the Winter months bring us a lack of variety in the kitchen. How do we make our meals fun and interesting and into something delectable we want to eat? The answer is simple. Vegetables. California’s bounty is incomparable and not to be taken for granted. From a variety of greens to colorful root vegetables, we still have a lot of produce options before spring rolls around. Don’t get discouraged. 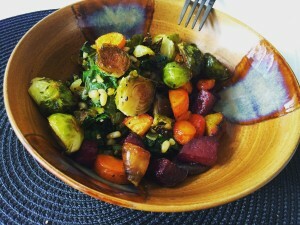 Focus on finding amazing fresh ingredients (found at your local farmers’ market) and the meal practically makes itself. Here is a veggie medley inspiration for you. Modify as you like! This meal was made in 3 parts. Makes 3-5 servings, depending on how hungry you are! Prep Time: 30 mins. Cook Time: 1 hour. Cut off Beet greens and put aside for Sautée (later). Cube beets and carrots to similar size. Mix in bowl with olive oil, salt, pepper, red pepper flakes, and lemon zest. Spread evenly on cooking sheet. Bake in Oven at 365° F for 45-50 mins. Clean and chop Brussel sprouts in half, if desired. I find it absorbs more flavor when they are chopped in half but usually just chop the bigger brussels. Mix in bowl with olive oil, salt, peeper, red pepper flakes and lemon zest. Spread evenly in cooking pan. Sprinkle nutritional yeast/ parmesan cheese on top. Cover in aluminum foil and poke a few holes in foil for ventilation. Cook covered in oven at 365°F for 30 mins. Uncover, stir it up a bit and cook for another 30 mins! Yum. Sautée can be done while everything else bakes! Yay for time-saving. Chop up onion and garlic and start the sautée with Olive oil on Medium heat. Add Shitake Mushrooms and pine nuts and let cook about 5-7 minutes. Chop up beet greens and add to your sautée. They cook down a lot! Add your salt, pepper and other herbs you like to taste! Cook ’til beet greens have cooked down a bit but are not soggy (about 5-8 minutes more). Now that you have your three components, add them in equal parts on top of rice or lentils. And enjoy! Heat the oven to 350ºF. Remove the stem from the pumpkin, cut in half, and scrape out the insides. Lay the two sides cut-side down on a rimmed baking sheet or in a large baking dish, and add just enough water to the dish to submerge the pumpkin in about ¼-1/2 inch of water, depending on what your pan will hold. Bake until fork tender, about 1 hour, checking occasionally, and adding more water as needed. Let cool. Scoop the pulp from the roasted pumpkin and puree in a food processor or blender until smooth. 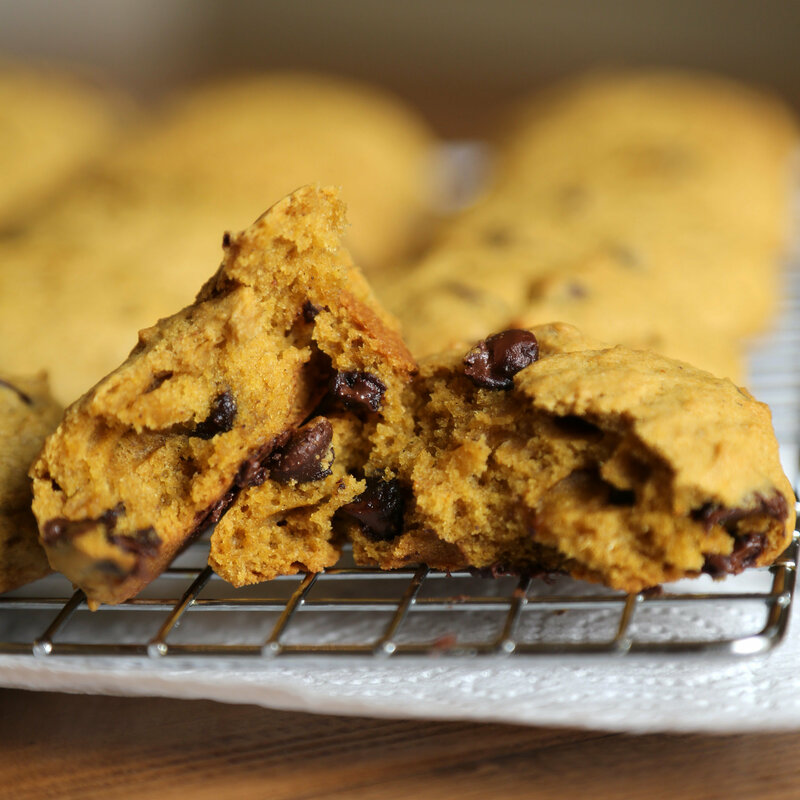 You will have more than enough for this recipe, so use for more cookies, or freezer and use later for pumpkin soup, pumpkin bread, or pumpkin pie! 1 cup pumpkin puree from fresh pumpkin! Heat the oven to 350ºF. Spray cookie sheets with nonstick spray or line them with parchment paper. Beat the butter until smooth using a standup mixer fitted with a paddle attachment, or simply in a bowl with a whisk. Beat in the white and brown sugars, a little at a time, until the mixture is light and fluffy. Beat in the eggs 1 at a time, then mix in the vanilla and pumpkin puree. Separately, in a large bowl, whisk together the flour, baking soda, salt, cinnamon, ginger, nutmeg, and cloves. Slowly beat the flour mixture into the batter in thirds. Stir in the chocolate by hand. Scoop the cookie dough by heaping tablespoons onto the prepared cookie sheets and bake for 15 to 20 minutes, or until the cookies are browned around the edges. Remove the cookie sheets from the oven and let them rest for 2 minutes. Take the cookies off with a spatula and cool them on wire racks. It’s hard to believe it’s already September and Fall is upon us! While we may notice season changes a little less here in temperate San Francisco, the agricultural world lives by the seasons and there’s no denying that we are transitioning. Soon the market will be full of apples, winter squash, and tender greens. 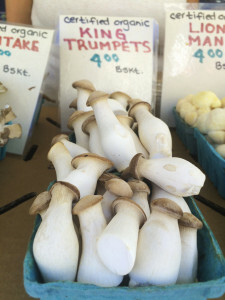 But let’s not overlook one crop that also thrives in the fall and winter- mushrooms! With cooler temperatures and more moisture in the air, perfect growing conditions will soon dominate for mushrooms. Annabelle and Abby, our MCM Mushroom Magicians! We are so lucky to have such a fabulous mushroom farm at our market, Far West Fungi. The Garrone family has been sustainably growing, distributing and marketing delicious mushrooms in the Bay Area for over 25 years! 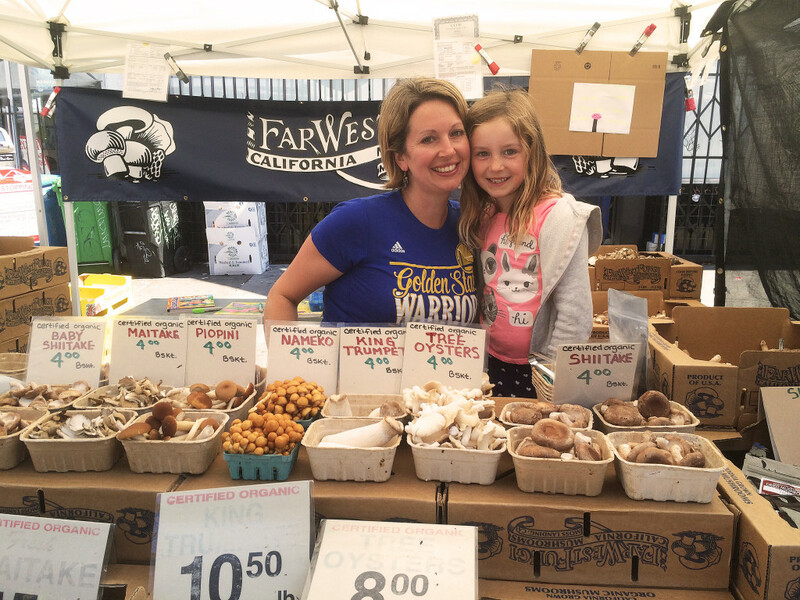 At their 60,000 square foot farm and facility in Moss Landing (right in the heart of Monterey Bay) they take great care to grow quality organic mushrooms. And the coastal fog gives the mushrooms that moisture they need to thrive. 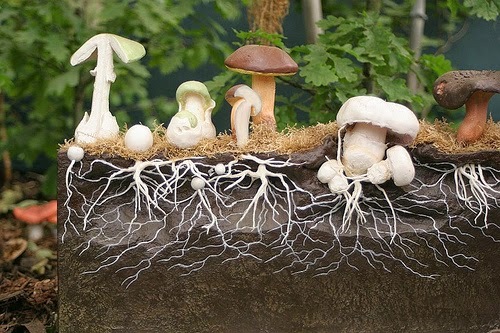 The mycelium of the fungi grow underground and the mushroom “fruits” are above ground. Mushrooms are just one part of a fungal organism. They are like the fruit of a fungal mycelium (thread-like structure) that grows underground (or through whatever it’s munching on). Far West Fungi’s site says it best- “The mushrooms is to mycelium what the apple is to it’s tree.” When the time and conditions are right, a lump forms on the mycelium and then “fruits” into a mushroom. And though some mushrooms are poisonous, sometimes they can be perfectly delicious. 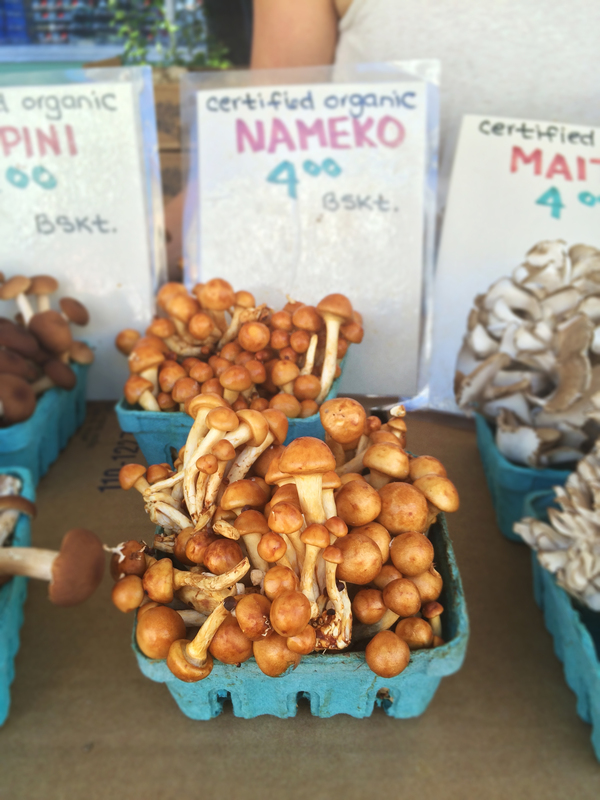 Just like there are many types of fruit, mushrooms come in a variety of shapes, sizes, colors and growth patterns. They also contain such a range and density of nutrients for a variety of health benefits unlike any other organism. Here is a little guide to at least help you out at the market. 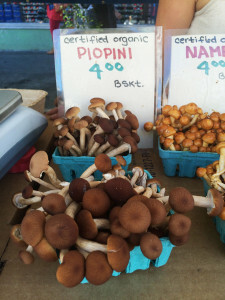 Most of us may be familiar with the classic Button Mushroom, or Crimini. They are mild in taste, easy to slice and can be used with versatility on dishes such as pizzas, pastas, sandwiches, and salads. Otherwise known as hen-of the-woods, this mushroom cluster can be grilled, sautéed or used in soups and stews. It can help build up your immune system and is traditionally used medicinally in Japan. Shiitake are another meaty mushroom used often in Japanese cooking. They are versatile and the stems can be used for a good veggie stock. 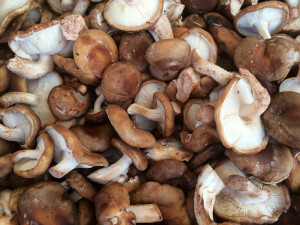 Studies show links between a protein that shiitake produce and cancer-prevention! Oysters are a delicious and meaty wild mushrooms which cooks very evenly when sautéed. 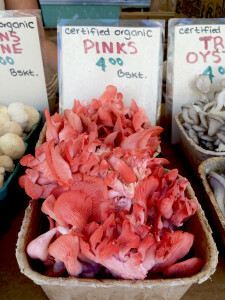 The pinks are a variety of the tree oyster and happen to have a shorter shelf life so use ‘em up quickly. They have antioxidant properties and are rich in iron. 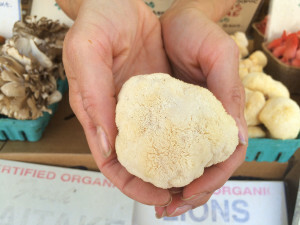 Also known as a King Oyster, these tasty and versatile mushrooms are cute and dense- they soak up a lot of flavor and have a pleasant abalone/scallop-like texture. They are high in protein and support healthy cholesterol levels. This fuzzy looking creature is part of the Tooth fungus family. It is often compared to seafood when used in cooking. A special benefit of this mushroom is that it has been linked to nerve-cell growth in anti-dementia studies. These gelatinous coated cuties are great for miso soups or a breakfast frittata. They have immune system strengthening properties as well as some anti-cancerous properties. They are peppery and nutty and great for a stir-fry. They also contain many antioxidant properties and can be used medicinally for anti-inflammation. For more resources on health benefits of mushrooms, check out this Infographic! 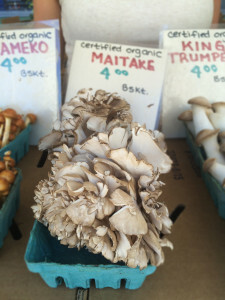 With the fall temperatures and higher possibility of rain, we are looking forward to seeing more varieties at the market this fall and winter like Hen of the Woods, Wine caps, Hedgehog mushrooms and more! Check out FWF’s Calendar online for a complete list. At the market. Look at all those varieties! 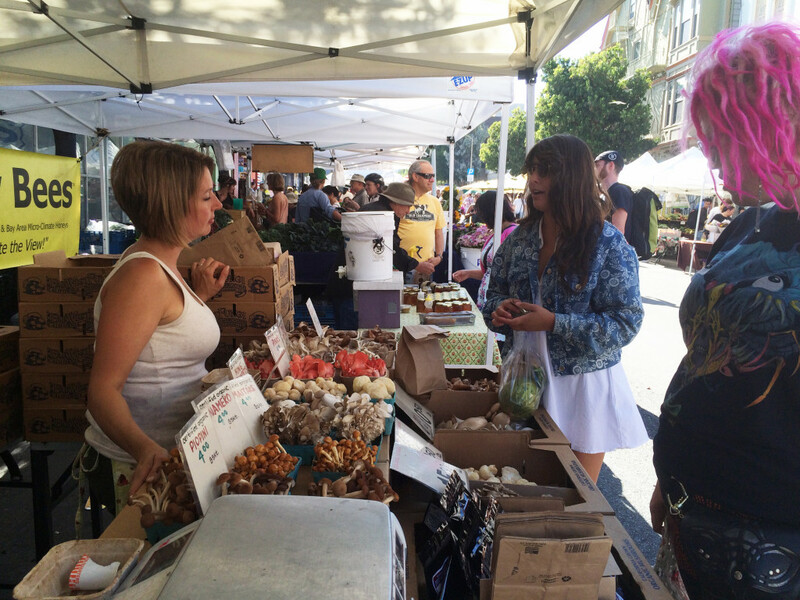 Please remember Far West Fungi does not attend the Market on every third Thursday of the month! After last week’s gazpacho recipe, I thought I’d share another one of my favorite dishes I came across when I lived in Barcelona. 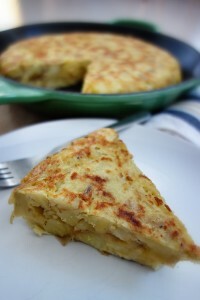 Tortilla de patatas is a staple in Spanish households and perhaps one of the best-known Spanish dishes. Locals eat it for breakfast, lunch or dinner and every self-respecting tapas bar has it in its repertoire. It’s incredibly easy to prepare with only 3 main ingredients: potatoes, eggs, and onion. You can eat it warm or cold, serve alongside some castelvetrano olives or a fresh bagel. Mix together diced potatoes and onion in a bowl and season with salt and pepper. Heat 4 tablespoons of olive oil in a skillet and add the potato-onion mixture. Cook, turning occasionally, over medium heat until potatoes are soft. In a large bowl, whisk the eggs with a pinch of salt. Add the cooked potato-onion mixture to the eggs, and stir to coat evenly. Heat the remaining 2 tablespoons of olive oil and add the egg-coated potatoes to the skillet, spreading them evenly to cover the base of the pan. 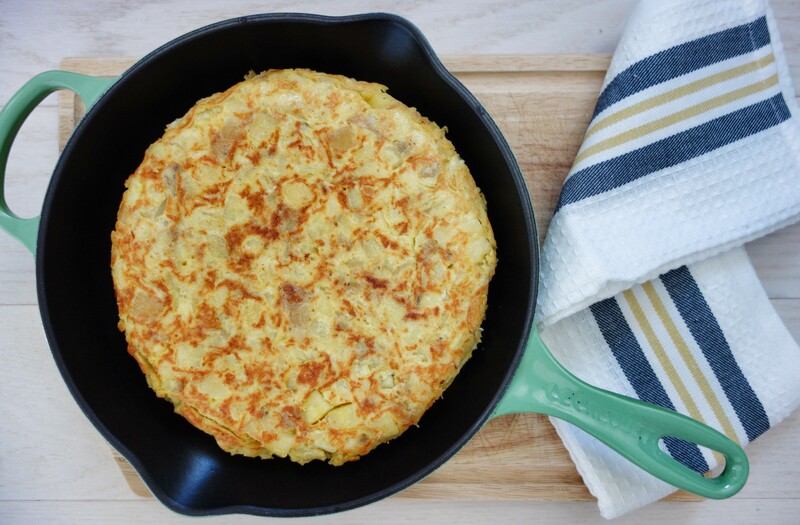 Once the mixture is half set (you can test this by shaking the skillet), cover the skillet with a large plate and flip the tortilla onto it. 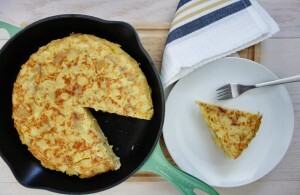 Then, slide the tortilla back into the pan with the uncooked side facing down. Cook until the second half of the mixture sets as well. Allow it to cool slightly, then cut into wedges and serve. *Eggs from Great Valley Poultry, potatoes from Happy Boy Farms, onions from Blue House Farms, optional olives from Home Maid Ravioli, optional bagels from Marla Bakery. Surprise! 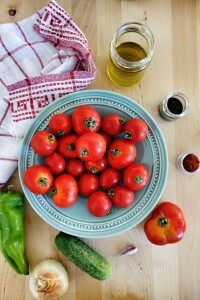 I have another tomato-based recipe for you! Gotta take advantage of the season while you can; am I right? 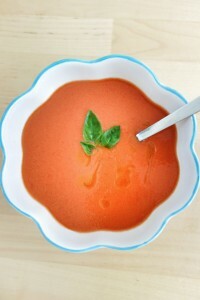 Gazpacho is a cold soup made of raw fruits and vegetables originating from Spain. This recipe is very close to my heart because I got it from my wonderful Catalan host family when I traveled to Barcelona a few years ago. It’s a staple in Spain, so much so that I’ve spotted people drinking canned gazpacho on the subway many times during the hot summer months. It’s such an easy dish and can be made ahead of time – in fact, it’s even better the next day. Take it to work in a Mason jar or sip on it at your weekend picnic. Put all ingredients in a blender or food processor and blend for 2 ½ minutes. Strain through a sieve and add more water if you need to thin it out.